Here you can find some useful maps and plans of Tignes that will help you locate us and help you plan your days on the slopes. They're quite big 'pdf' files so you may need to wait for them to download. - Click here for a pop-up plan of the resort of Tignes. Our apartment is in square 'B4' where the number '96' is. 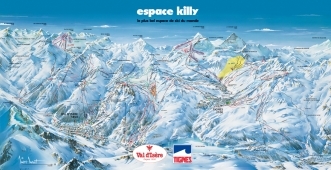 - Click here for the Espace Killy piste map. This is the 2006 version, but you can pick up free up-to-date ones all over resort.